A mother makes a quilt for her baby son. Of course, it’s no big deal, after all countless Moms across the world and across ages have done it. But when that quilt becomes the beginning of an art movement, you know that we’re not talking of an ordinary Mom! That’s right, we’re talking about Sonia Delaunay, an amazing woman and the first living female artist to have an exhibition at the Louvre. 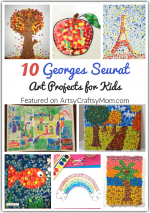 Today we’re going to focus on this inspiring artist with some Sonia Delaunay Art Projects for Kids! Sonia Delaunay was born Sarah Stern, to Ukrainian parents. She was then adopted by her uncle and aunt in Russia, and became Sonia Terk. She studied art in Germany and Paris, where she lived later and met her husband Robert Delaunay. The Delaunay couple were pioneers of Orphism, an art movement that was inspired by Cubism but involved bright colors. Orphism, also known as simultanéisme, is also derived from Pointillism, where colors are placed next to each other, creating a different overall effect to the viewer’s eye. 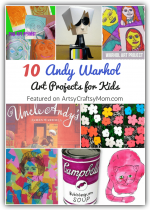 Let’s learn more about this wonderful artist through some fun art projects! A lot of Sonia Delaunay’s work features geometric shapes, and this artist study at The Artful Parent uses solid shapes! Hand kids wooden or plastic blocks in different shapes and let them use these along with a ruler to trace the shapes on paper. 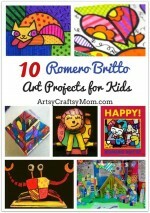 Give them bright paints and let them choose the colors for some lovely art! This art project from Deep Space Sparkle is a great cutting exercise. 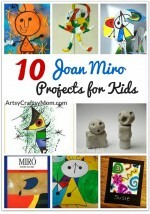 Let kids trace out circles out of common household objects and cut them out of colored paper. Stick the paper circles in different patterns on plain paper and watch how the art comes alive! If you have a set of circle stencils then you’re all set to try this lovely art project from Art Projects for Kids! Draw them touching each other and then draw a line through the middle. Use colored sharpie markers to fill in the circles, with contrasting colors next to each other, Delaunay style. If you don’t have stencils, you can use things you find around the house too. If your kids have tried the circle-cutting exercise in the art project mentioned above, then maybe it’s time for something a little more challenging! This project from The Making Table uses felt sheets, which are cut into circles and then halved. Rearrange the circle halves in contrasting colors for some gorgeous, texture-filled art! This is an absolutely delightful book that’ll appeal to everyone – adults and kids alike! The book features lovely little pop ups based on Delaunay’s art, created by paper engineer, Gérard Lo Monaco. Along with the pop ups, the book has fun rhymes to match the illustrations. This is a good weekend project for the little ones, especially if they like getting messy! Get sponge pouncers or sponges in different shapes and bright paints. Then put on an apron, spread lots of newspaper and get stamping with the sponge shapes. 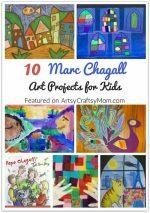 If you’ve got little ones who are just starting to learn about art, the stencils and tracing may be a bit too much. In this case, just download and print these free Delaunay coloring pages from Deep Space Sparkle, and tell the kids to color adjacent shapes in different colors, for true Delaunay effect. Sonia Delaunay’s work wasn’t limited to painting canvases, she was also a designer. Get the kids to experiment painting and cutting fabric too, for a change from paper. 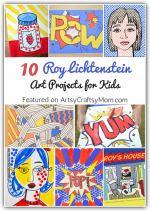 Show them pictures of her work and tell them the story of how a mother created art in a patchwork quilt for her son!